The biggest expansion pack yet for Flash Point: Fire Rescue, Extreme Danger contains the one-story Mechanic's Garage and two-story Laboratory game boards. Both these boards can be further expanded with the included Attic/Basement game board for up to three stories of fire fighting. New challenges include floor damage, chemical spills, jammed fire proof doors and explosive special equipment. Also included is the hydraulic platform and the 9 specialist figures. Flash Point: Fire Rescue is a cooperative game that is fun to play with friends and family. All the players are on the same team - everyone either wins or loses together. With four levels of play (Family, Recruit, Veteran and Heroic) there is a challenge appropriate for players of all skills and ages. 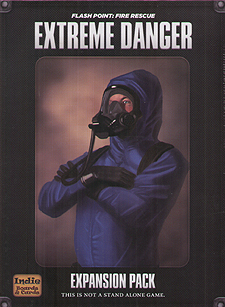 Extreme Danger is an expansion for Flash Point: Fire Rescue.